This Equal air mattress system is the newest product released to the home health care community. This foam and air mattress replacement system can operate as a dynamic self-adjusting non powered mattress or alternating pressure therapy with the optional control pump. This is the same ultra comfortable medical air mattress used in many hospitals today. The patented valve system constantly adjusts pressure by allowing air to move in and out of the mattress to conform to the specific weight, shape and contour of each patient. This medical air mattress uses independent zones created by using different densities of foam. The air tubes form an anatomically design profile that mirrors the shape of the human body. This pressure reduction mattress system uses a unique 2 way valve system that constantly adjusts pressures by allowing air to move in and out of the mattress. No power necessary to conform to the specific weight, shape and contour of each patient. This medical mattress system offers the simplicity of a therapeutic foam mattress with the therapy of an air mattress. It is easy to clean, easy to use and maintenance free. 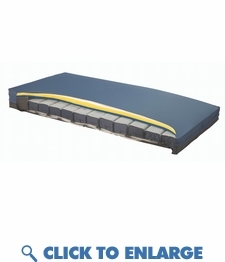 This equal air mattress system can be utilized for high risk patients for prevention through stage IV pressure ulcers. By adding an optional pump (powered), equal air mattress can be converted to an alternating pressure system. This Equal air mattress system is the newest product released to the home health care community. This foam and air mattress replacement system can operate as a dynamic self-adjusting non powered mattress or alternating pressure therapy with the optional control pump. This is the same ultra comfortable medical air mattress used in many hospitals today. The patented valve system constantly adjusts pressure by allowing air to move in and out of the mattress to conform to the specific weight, shape and contour of each patient. This medical air mattress uses independent zones created by using different densities of foam. The air tubes form an anatomically design profile that mirrors the shape of the human body. This pressure reduction mattress system uses a unique 2 way valve system that constantly adjusts pressures by allowing air to move in and out of the mattress. No power necessary to conform to the specific weight, shape and contour of each patient. This medical mattress system offers the simplicity of a therapeutic foam mattress with the therapy of an air mattress. It is easy to clean, easy to use and maintenance free. This equal air mattress system can be utilized for high risk patients for prevention through stage IV pressure ulcers. By adding an optional pump (powered), equal air mattress can be converted to an alternating pressure system.